The film's title refers to the period of non-stop activity from when Ralston awoke on the day of his accident to when he was put under anesthesia during his rescue. Ralston himself, his wife and son make cameo appearances at the end of the film. The scenes early in the film of Ralston's encounter with the two hikers were altered to portray Ralston showing them a hidden pool, when in reality he just showed them some basic climbing moves. Despite these changes, with which he was initially uncomfortable, Ralston says the rest of the film is "so factually accurate it is as close to a documentary as you can get and still be a drama." Franco is never shown uttering even an "Ow"; Ralston wrote that this is accurate. Ralston did send Monique and Andy to run ahead to get help, and Ralston did walk seven miles before the helicopter came, although this trek is shown in the film's alternative ending. Danny Boyle had been wanting to make a film about Ralston's ordeal for four years; he wrote a film treatment and Simon Beaufoy wrote the screenplay. Boyle describes 127 Hours as "an action movie with a guy who can't move." He also expressed an interest for a more intimate film than his previous film, Slumdog Millionaire (2008): "I remember thinking, I must do a film where I follow an actor the way Darren Aronofsky did with The Wrestler. So 127 Hours is my version of that." Boyle and Fox Searchlight announced plans to create 127 Hours in November 2009, and News of the World reported that month that Cillian Murphy was Boyle's top choice to play Ralston. In January 2010, James Franco was cast as Ralston. In March 2010, filming began in Utah; Boyle intended to shoot the first part of the film with no dialogue. By 17 June 2010, the film was in post-production. Boyle made the very unusual move of hiring two cinematographers to work first unit, Anthony Dod Mantle and Enrique Chediak, each of whom shot 50 percent of the film by trading off with each other. This allowed Boyle and Franco to work long days without wearing out the crew. Franco admitted that shooting the film was physically hard on him: "There was a lot of physical pain, and Danny knew that it was going to cause a lot of pain. And I asked him after we did the movie, 'How did you know how far you could push it?' ... I had plenty of scars...Not only am I feeling physical pain, but I'm getting exhausted. It became less of a façade I put on and more of an experience that I went through." 127 Hours was screened at the Toronto International Film Festival on 12 September 2010, following its premiere at the 2010 Telluride Film Festival. The film was selected to close the 2010 London Film Festival on 28 October 2010. It was given a limited release in the United States on 5 November 2010. It was released in the United Kingdom on 7 January 2011, and in India on 26 January 2011. There were many published reports (not all confirmed) that the trailer and film made audience members ill. The Huffington Post, in November 2010, wrote that it "has gotten audiences fainting, vomiting and worse in numbers unseen since The Exorcist – and the movie has not even hit theaters yet." During the screenings at Telluride Film Festival, two people required medical attention. At the first screening, an audience member became lightheaded and was taken out of the screening on a gurney. During a subsequent screening, another viewer suffered a panic attack. Similar reactions were reported at the Toronto International Film Festival and a special screening hosted by Pixar and Lee Unkrich, director of Toy Story 3 (2010) and Coco (2017). The website Movieline published "Armed and Dangerous: A Comprehensive Timeline of Everyone Who's Fainted (Or Worse) at 127 Hours." On review aggregation website Rotten Tomatoes, the film has an approval rating of 93% based on 226 reviews, with an average rating of 8.3/10. The site's critical consensus reads, "As gut-wrenching as it is inspirational, 127 Hours unites one of Danny Boyle's most beautifully exuberant directorial efforts with a terrific performance from James Franco." On Metacritic, which assigns a weighted average rating to reviews, the film has an average score of 82 out of 100, based on 38 critics, indicating "universal acclaim". Writing for DVD Talk, Casey Burchby concluded that "127 Hours will stay with you not necessarily as a story of survival, but as a story of a harrowing interior experience". Richard Roeper of The Chicago Sun-Times gave the film four stars, said he believed Franco deserved an Oscar nomination for his performance, and called the film "one of the best of the decade." Roger Ebert also awarded the film four stars and wrote that "127 Hours is like an exercise in conquering the unfilmable". Gazelle Emami wrote for The Huffington Post, describing Franco's performance as "mesmerizing" and "incredible." 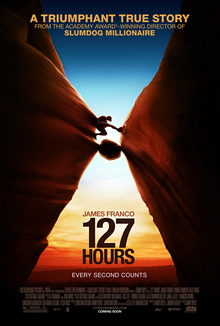 127 Hours was nominated for three Golden Globe Awards, including Best Actor, Best Screenplay and Best Original Score. The film was nominated for nine British Academy Film Awards, including Outstanding British Film, Best Direction, Best Actor in a Leading Role, Best Adapted Screenplay, Best Cinematography, Best Editing, and Best Film Music. The film got six nominations at the 83rd Academy Awards, including Best Picture, Best Actor, Best Adapted Screenplay, Best Original Score, Best Original Song, and Best Film Editing. It was also nominated for eight Broadcast Film Critics Association, including Best Film, Best Director, Best Actor, Best Adapted Screenplay, Best Cinematography, Best Editing, Best Song, and Best Sound. Its main theme song "If I Rise" won the Critics Choice award for Best Song. James Franco was awarded Best Actor by the New York Film Critics Online and the Dallas–Fort Worth Film Critics Association.